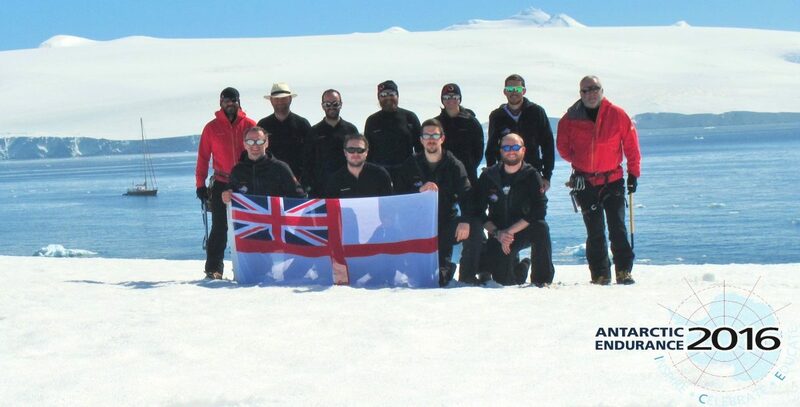 Antarctic Endurance 2016 sets out to inspire, celebrate and educate. It is the last of these that concerns the research we are running. What can we learn from such an expedition? And how can we learn it so that our findings can be passed on and help others? Why are we doing this research? At the heart of the research are two simple questions: what makes individual people resilient? And how do you create a resilient team? What follows from these questions is a straightforward idea that we want to test out: does doing challenging things and excelling at them make us more resilient and robust? And how can doing more demanding activities help us be individually and collectively tougher? Our research is supported by the Institute of Naval Medicine, and for obvious reasons is of interest to the MOD. One way of preparing for extreme situations – which include subjective and objective dangers – has traditionally been through adventurous training. The UK has developed its own flavour of this, derived from the Outward Bound movement and the Duke of Edinburgh Award. Both schemes rely on the idea that if you give people tough things to do, they will become more resilient by doing them. Talk to any D of E participant and you will sense something deep at work in the relation between surmounting challenges and building character. We are delighted that the Duke of Edinburgh – a former Royal Navy Officer – is the Royal Patron of the Expedition. Those of us who love the open seas and the high mountains instinctively feel that exposure to their dangers and survival in their environments give us reserves of confidence that carry over to other parts of life. Sail through that storm, and you might feel ready for anything. Climb that rock face and our everyday problems might seem less daunting. Yet here was a chance to look at an adventurous expedition to see if this effect could be measured. How do we go about this? Our research asks the expedition group to answer some well-established psychometric questions after each round of adventurous training. At the end of the expedition, we can look back and, from analysing the results of the psychometric questions, see if there were qualities of robustness that emerged through training or that were present from the start. Our final party of 18 are selected from the expedition group of around 50; what qualities do they possess? All the members of AE16 are Naval Personnel. So, does simply being in the Royal Navy make you more robust? To test that we looked at a group of Naval Personnel who did not volunteer for AE16, and tested them at the same time. The psychometric tests, taken by each group member at several points during the two-year training for the expedition together form an invaluable set of data. In addition to this we are keeping an individual record of each person’s journey by means of the radical use of maps. For this, we have enlisted the expertise of Sharon Curry at Fathomicity. She is a former Naval Officer and now one of the world’s foremost mappers: she maps both individual and group experience. What, then, do we hope the research will tell us? Well, it should answer the question what makes individuals resilient? This will be of use to the Institute of Naval Medicine and, in a wider context, to the MOD (which needs proof of the value of adventurous training) and even more broadly, to those in the commercial sector interested in what makes leaders and team members resilient. The team element is different, and our approach here has been to look at radically new ways of recording and collating sensory and emotional experience. Here, again, the use of Fathomicity’s maps has been of paramount importance. Their maps provide a precise and rich emotional and practical record of all our team training events. The maps record our time in the wet Snowdonian mountains, at sea in the south-west approaches, or in the snows of the winter Cairngorms. Each map shows how every phase of training helps build our expedition team ethos and mutual values. Our research is therefore both quantitative and qualitative. It tells the story of the expedition in figures and in words. Because of AE16 we will know more about how individuals and teams can prepare for and perform in demanding environments that push us to the extremes of our capabilities.